Sunday will be Father's Day. theSun got the award winning film maker Shanjhey Kumar Perumal, to describe his relationship with his father and his new born son. Filmmaker Shanjhey Kumar Perumal’s debut film, Jagat, was somewhat inspired by his own relationship with his father, Perumal Annamalai, 68. The film, written by the 37-year-old centres on a boy who tries to find a suitable role model among the three men in his life – his labourer father and his two uncles. His father has very little time for him, while one uncle is a gangster, and the other, aformer drug addict. Jagat created history when it became the first non-Bahasa Malaysia film to grab the best film award at the 28th Malaysian Film Festival in 2016. Shanjhey also walked away with the best new director award. Jagat went on to take five more awards at the 2016 Kuala Lumpur Film Critics Awards. On March 31 this year, Shanjhey became a first-time father with the birth of his son. That life-changing experience allowed him to understand his own dad better. He remembers playfully wrestling with his father on many occasions, and his dad reading bedtime stories to him. “My father was the first person who told me about the Malaccan warrior Hang Tuah,” he says. He believes his father’s storytelling inspired him to tell his own stories through films. But their relationship changed when Shanjhey entered his teenage years. “There was bitterness in our relationship,” recalls Shanjhey of that period of time growing up in Parit Buntar, Perak. His father was a general worker and gardener at Shanjhey’s high school.Perumal also sold ice kacang and newspapers to earn extra money. Shanjhey would often help his father at the stall and to deliver newspapers. “My father woke up at 5am every day, and only stopped working after 7pm,” he says. “When he got home, he was too tired to spend time with me. I felt neglected. I was angry at him for putting his work first. I did not understand his predicament then. intervened and stopped the fight. “I was protecting my father’s honour and he was not grateful,” recalls Shanjhey. Things got worse when Shanjhey entered Form Six. His father forced him to stay with his uncle, who lived miles away from their hometown. “I was angry at my father for separating me from my friends,” he says. Only much later did Shanjhey realise that whatever his father did, it was done with the best intentions in mind. From then on, he concentrated on his studies and eventually, graduated with a Communication degree in Film and Broadcasting from Universiti Sains Malaysia in Penang. “My father shaped me to be the person I am today,” he says. 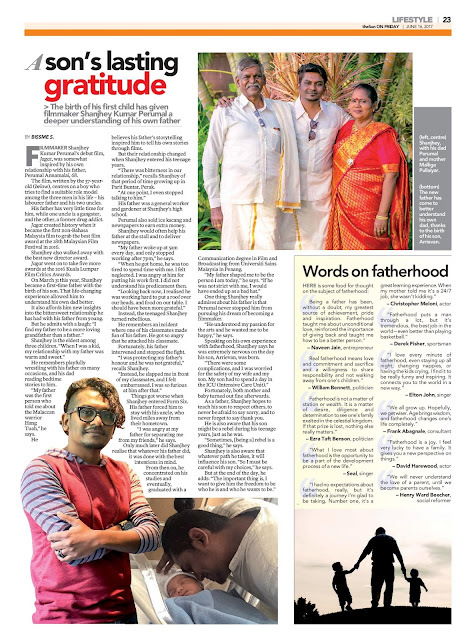 One thing Shanjhey really admires about his father is that Perumal never stopped him from pursuing his dream of becoming a filmmaker. “He understood my passion for the arts and he wanted me to be happy,” he says. Speaking on his own experience with fatherhood, Shanjhey says he was extremely nervous on the day his son, Arrievan, was born. Fortunately, both mother and baby turned out fine afterwards. As a father, Shanjhey hopes to teach his son to respect others, to never be afraid to say sorry, and to never forget to say thank you. He is also aware that his son might be a rebel during his teenage years, just as he was. “Sometimes, [being a] rebel is a good thing,” he says. Shanjhey is also aware that whatever path he takes, it will influence his son. “So I must be careful with my choices,” he says.